Ross works on a wide variety of subject areas in the biotechnology, pharmaceutical and medical device fields. Ross has particular experience working on inventions involving immunology, cell biology, genomics, microbiology, cancer therapeutics and drug delivery. Ross advises a range of domestic and international companies from universities and small start-ups, through to medium and large biotech and pharmaceutical companies. Ross is experienced in biotech patent drafting, global and European patent prosecution, conducting European freedom-to-operate assessments and European oppositions and appeals. 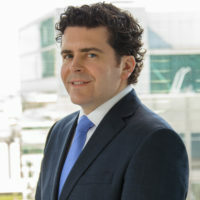 His background working both in private practice and industry has helped Ross to develop experience not only of managing large patent portfolios, but also providing strategic advice in relation to patent and SPC litigation, merger and acquisition due diligence and pharmaceutical product development, life-cycle management, clearance and launch strategies. Ross seeks to understand his clients’ commercial and strategic goals and tailors his intellectual property advice accordingly. In his spare time, Ross enjoys regularly working out at his local CrossFit Box and spending quality time with his wife and young daughter.